A brief update, over past years I have continued working with spring integration and in quest to share my experience I have put challenges faced by me and it’s programmatic solution in a book name spring integration essentials which is available at amazon and packtpub. , and code samples at Github -please free to connect with me for any clarification or issues. I worked on one of the projects using spring integration. thought of sharing a quick hands on tutorial. I will cover following along with code snippet. Intercommunication between these modules have always been a challenge. How a c/c++ application talk with Java app, how CORBA and SOAP can be made seamless, how a File system and DB interaction be made possible -these all have been tried in multiple different ways. Enterprise Application Integration is an effort to address these kind of scenario. server which contains input for other application. catalogue of product can be stored at same DB location which different vendors can use. enterprise pattern defines major patterns for enterprise integration. Spring Integration is one of the implementation of the enterprise patterns. When we talk of heterogeneous communication, additional challenges comes in terms of synchronous and asynchronous communication mode. One of endpoints may not be available at time of interaction, or may be less responsive -this necessitates a need for an orchestrator which can retry, communication back, audit and do other stuff in role of a mediator. Here enters Enterprise Service Bus (ESB). ESB acts as mediator between these heterogeneous interfaces. As discussed earlier, there have been numerous attempts to address the EAI. It’s difficult to list all –but two examples are. Mule ESB : It is a container, application need to be dropped in to leverage its support. Service Mix: It is another ESB, having a heavy footprint and trying to address lot of issues with lot of modules (OSGI Bundles)! Description of any of the above is beyond scope. Routing: It should be able to route messages across different endpoints based on configured rules or conditional logic. Messaging: Convert message to and from different incompatible format to a normalized format. Mediation: Making communication possible between heterogeneous interfaces. Complex Event Processing (CEP): Capability to listen for events and trigger it as well. Invocation: It should be able to orchestrate service interaction and invocation. It should also support logging, auditing, authentication (security), and management, etc, above and beyond the services listed above. by the framework while handling that object. It consists of a payload and headers. The payload can be of any type and the headers hold commonly required information such as id, timestamp, correlation id, and return address. 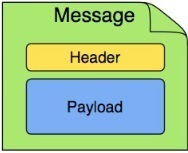 A Message Channel represents the “pipe” of a pipes-and-filters architecture. Producers send Messages to a channel, and consumers receive Messages from a channel. The Message Channel therefore decouples the messaging components, and also provides a convenient point for interception and monitoring of Messages. A Message Channel may follow either Point-to-Point or Publish/Subscribe semantics. With a Point-to-Point channel, at most one consumer can receive each Message sent to the channel. Publish/Subscribe channels, on the other hand, will attempt to broadcast each Message to all of its subscribers. Should channels buffer the messages? Pollable Channels are capable of buffering Messages within a queue. The advantage of buffering is that it allows for throttling the inbound Messages and thereby prevents overloading a consumer. On the other hand, a consumer connected to a Subscribable Channel is simply Message-driven. A Message Endpoint represents the “filter” of a pipes-and-filters architecture. As mentioned above, the endpoint’s primary role is to connect application code to the messaging framework and to do so in a noninvasive manner. In other words, the application code should ideally have no awareness of the Message objects or the Message Channels. This is similar to the role of a Controller in the MVC paradigm. Just as a Controller handles HTTP requests, the Message Endpoint handles Messages. Just as Controllers are mapped to URL patterns, Message Endpoints are mapped to Message Channels. The goal is the same in both cases: isolate application code from the infrastructure. A Message Transformer is responsible for converting a Message’s content or structure and returning the modified Message. Probably the most common type of transformer is one that converts the payload of the Message from one format to another (e.g. from XML Document to java.lang.String). Typical use case : Convert XML and File based payloads to Domain objects. A Message Filter determines whether a Message should be passed to an output channel at all. This simply requires a boolean test method that may check for a particular payload content type, a property value, the presence of a header, etc. A Message Router is responsible for deciding what channel or channels should receive the Message next (if any). Typical use case: If a XML is parsed successfully, it is passed on to next channel for further processing else is routed on a retry channel. A Splitter is another type of Message Endpoint whose responsibility is to accept a Message from its input channel, split that Message into multiple Messages, and then send each of those to its output channel. Typical use case: After fetching list of files from a remote FTP server, list of files is put on a splitter, which then puts it on a gateway –one by one, so that each file can be fetched. Basically a mirror-image of the Splitter, the Aggregator is a type of Message Endpoint that receives multiple Messages and combines them into a single Message. Spring Integration provides a completion strategy as well as configurable settings for timeout, whether to send partial results upon timeout, and the discard channel. Typical use case: PDF and related images are available from FTP server. Aggregator is used to wait for both (PDF and associated JPEG) of them to be available –correlation strategy decides if both are available or not. Once available it is passed on for further processing. A Service Activator is a generic endpoint for connecting a service instance to the messaging system. The input Message Channel must be configured, and if the service method to be invoked is capable of returning a value, an output Message Channel may also be provided. The output channel is optional, since each message may also provide its own ‘Return Address’ header. This same rule applies for all consumer endpoints channel specified in the Message’s “return address” if available. Typical use case: All business processing done in service activator, for example persistence. A Channel Adapter is an endpoint that connects a Message Channel to some other system or transport. Channel Adapters may be either inbound or outbound. An outbound “Channel Adapter” endpoint connects a MessageChannel to a target system. Sing line of configuration exposes all of the channels on standard JMX console. It can depict the Integration flow diagrammatically. HTTP outbound gateway writes its response to HTTP response channel. Service Activator takes input from persister channel and performs business logic. Main.java : main class, this boots up the application. SimpleTransformer.java :Transformer, which transforms the message –it just adds some custom string. It can be more meaning full as transforming to domain object. HttpResponsePersisterService.java : Service activator –here business logic as persistence can go. For e.g. have just logged it in a log file. spring-sample-app\src\main\resources\log4j.properties : Log file settings. Posted on October 29, 2012, in Coding practice, Spring, Spring Integration and tagged code sample, Development, spring, Spring Integration tutorial, tutorial. Bookmark the permalink. 6 Comments. Could not download code on Github. 404 This is not the webpage you are looking for. Thanks for pointing. Please try now -I have corrected the link. I’m new to Spring integration – I have a Cloud server that I would like to transfer files to and from using Spring Integration. What setup do I need on the cloud server? can you provide an example of reading file from database and write into file using spring integration.